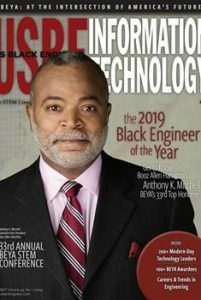 Grab your copy of US Black Engineer & Information Technology (USBE) magazine now. The 2019 Conference issue is out! Take a peek here. The latest edition of USBE magazine is available onsite at the BEYA STEM Conference. Get your copy and read about the award winners and what’s happening in the STEM community. The new issue is available now. Click here. The brand new Conference Issue of USBE Magazine is packed with everything you need to know about the award winners at the 33rd annual BEYA STEM Conference. I would like to know how to contact Mr. Anthony Mitchell. We would like to have him as a speaker at the National Reconnaissance Office (NRO) for our Juneteenth festivities.